Jack Meijer ran to a superb fourth place in the opening UK Cross Challenge race in Cardiff. Racing in the under 17 men’s race he completed the 5.6km course in 15.56. During the summer Jack set M17 club records for 1500m (3.59.02) and 3000m (8.37.91) and ran the second fastest 800m (1.56.40). He is no doubt set up for a good cross-country season. A number of MMKAC runners have completed Autumn Marathons. There were three in Chicago, both Tom Hayman (3;03.41) and Wendy Webber (3:04,47) just outside three hours. Wendy placed 29th in the F35 age category. Geoff New, struggling with an injured knee, finished in 4:23.11. Also running overseas was Victoria Kirschner-Heavens setting a PB of 3:54.36 in Amsterdam. Simon Kirschner-Heavens clocked 3:41.57. Back in the UK, Siobhan Dyer ran 4:32.24 in the Bournemouth Marathon, Andrew Wasdell ran the Leicester Marathon(3:03.49) and Paul Sutherland was in Chelmsford where he clocked 3:44.29. 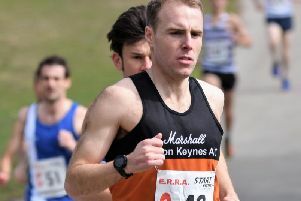 Finally two sub 3-hour times from Ross Wood (2:57.26) and Mike Kerrigan (2:57.42) in the Abingdon race, a PB for Ross. Tim Aldridge closed in with a time of 3:26.30.